Pixi Rose Blend Oil is a blend of oils (sweet almond, rosehip, jojoba, pomegranate seed and rose geranium), yet it isn't heavy in texture. It is light enough to be used as part of my morning skincare routine and I sometimes even add a tiny drop to my foundation, which adds some dewiness yet doesn't break my base down at all. Whatever way I use it, my skin is left nourished and glowing and, of course, the rose scent is beautiful. Korres Wild Rose Advanced Brightening Face Oil is one of my favourite skincare discoveries from 2016. This oil is infused with real rose petals, rose oil and Super C, which boosts the skin's absorption of Vitamin C - the result is bright, radiant, nourished skin. This is my second bottle of this and in a few weeks time when the Autumn weather kicks in, it will be back in my daily morning skincare routine to help combat any dullness that might occur. Omorovicza Queen Of Hungary Mist is lightly scented with neroli and rose and can be used as a post acid spritz or to refresh the skin or your base throughout the day. It has a subtle, uplifting scent and a very fine mist. A very decadent product and how pretty is this limited edition bottle? Omorovicza Gold Hydralfting Mask is a soothing, plumping pink mask that is lightly rose-scented. It is really nourishing and results in glowing, hydrated, plump skin that looks bright and is the perfect antidote to tired, grey, dull skin days. The whole Omorovicza line is perfect for sensitive, reactive, stressed skin. Nivea Rose & Argan Oil in Lotion is my current daily body lotion. I'm a huge Nivea body lotion fan anyway but the inclusion of oil in this lotion along with the rose scent makes this my favourite body lotion from the brand. It absorbs quickly and leaves my skin feeling soft, smooth, nourished and smelling of roses! It is also very budget-friendly, which is always a good thing. Ouai Rose Hair & Body Oil is a multi-tasking product that is quite light in texture but very nourishing, which is perfect for both hair & body because it doesn't weigh the hair down and also absorbs quickly on the skin so you don't need to hang around before getting dressed. It really quenches my skin's thirst and I love applying a few drops to my hands before running through the ends of my hair to add some shine. This is my first foray into Ouai haircare and I definitely want to explore the brand more so if you have any recommendations, please leave them below! 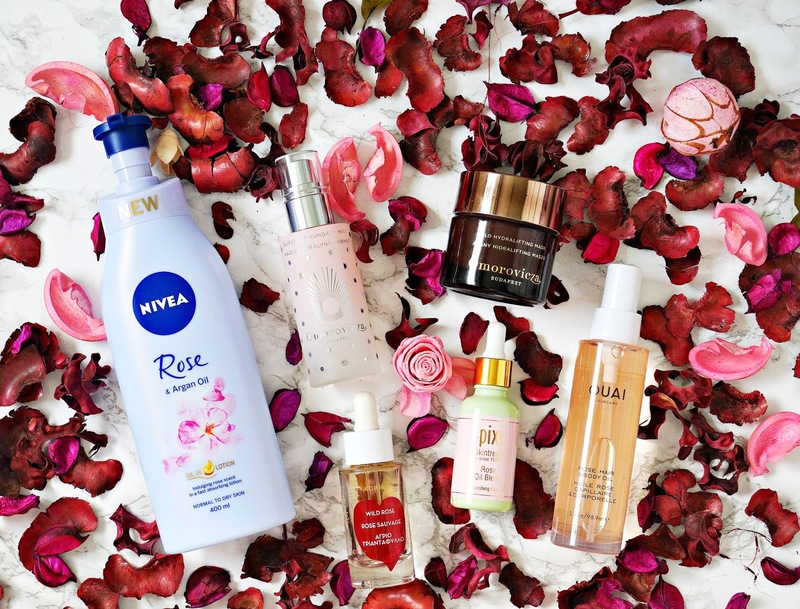 Are you a fan of rose scented products? If so, what are your favourites? All products are bought by me, unless otherwise stated. The Korres oil and Omorovicza products were sent to me. Opinion is always my own.